- Pentacles can represent the five elements (earth, air, fire, water, and spirit) or the five stages of Life (birth, youth, adulthood, old age, and death). In both cases, the path used to trace the star shape symbolizes the continuity and connection between the extremes. Approximately 1-1/16" in diameter. Includes 18" Sterling Silver chain. 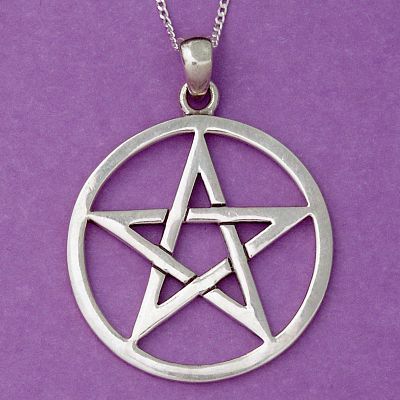 Do you have any other questions about our Silver Large Open Pentacle Pendant? This pendant is a simple but great piece of jewlery! It also seems very durable and well crafted, compared to previous pendants that were easily broken or rusted. It really is a great little piece to express myself and beliefs with any look. Besides the product, the shipping service was surprsingly fast and stress free. I recieved the pendant and another product by Gryphon's Moon within two days, despite being in a different state. This is a most beautiful piece of jewelry, and I get complements everytime I wear it.